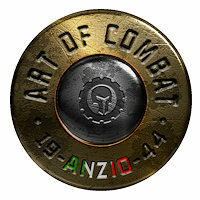 Tackom Ltd is developing a new Tactical Simulation Art of Combat: Anzio 44. This new game will be a hybrid game with a complete strategic layer, as well as a battle layer for real time battles. The best way to imagine Art of Combat is as an old table top game. The Table is the Strategic [Strat Map] This is where the operational aspects of the game take place. You move your Bgs [Battle Groups] around, [Infantry – Armour – Recon – Heavy Infantry – Engineers – Mixed etc] . You endeavor to outmaneuver your AI or human opponent as you would on a real table top, using real tactics. Once you have moved units, sorted supply, intel etc out, you finish your “turn” hit next, the opponent moves in the same way. At this point Battles will occur, this is where you drop down to the battlemap, to actually fight your battles in realtime. This is where the actual real time fighting will occur. Here below the Strategic [Strat] layer, on the Battle layer is where your Battle Groups will engage in real time combat. With a far better AI than any tactical wargame until now, with AA class modelling and graphics, pathing, physics etc, you will be able to fight ultra-realistic battles with features that have never been seen before in any game. What we as developers are aiming to do, is to create a new type of wargame, with brand new features. All it will have in common with past RTS type games is that it will be Real Time. It is essentially an RTTS [Real Time Tactical Simulation]. The aim is to build a game that will eventually cover many time periods, not just WW2. The game will have a host of features, such as civilians who can become insurgents/partisans, booby traps, the ability to realistically model many differing types of tactical warfare from WW2 to Asymmetric, insurgent based warfare. Find out more, view some screenshots, and join the game forum at the official Art of Combat website.